Taking full advantage of the UHS-II technology, the RDF9 UHS-II Card Reader unleashes the high-speed performance of SDXC / SDHC UHS-II memory cards. Equipped with USB 3.1 Gen 1 interface, the RDF9 delivers the blazing fast read and write speeds of up to 260MB/s and 190MB/s accordingly*, facilitating high resolution video and RAW image transfers and post-production processing for professional photographers, videographers and graphic designers. Additionally, it also boasts the CompactFlash, SD and microSD card slots, offering you to transfer different types of digital files with one compact card reader. The RDF9 UHS-II Card Reader with the latest UHS-II interface is here to unleash the high speed performance of a UHS-II SD card, transferring high resolution RAW images and HD videos to your computer just in seconds. In addition, it is backward compatible with UHS-I and any other SDXC and SDHC SD cards. Taking full advantage of USB 3.1 and UHS-II technology, the read and write speeds of the RDF9 are up to 260MB/s and 190MB/s accordingly. When paired with a 32GB Transcend's UHS-II SD card, the RDF9 only takes 38 seconds to transfer a 8GB of video file. High speed boosts your workflow and efficiency. The versatile RDF9 lets professional photographers, videographers and graphic designers transfer data at high speed, accelerating the entire post-production processing. Besides the SD card slot, the multifunctional RDF9 also boasts CompactFlash and microSD card slots, offering you to transfer different types of digital files with one compact card reader. 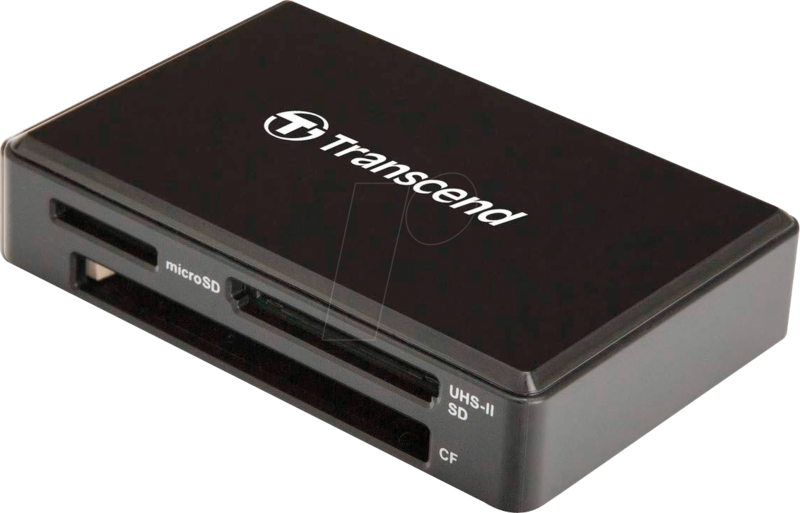 Transcend’s RDF9 card reader includes a free download of our exclusive RecoveRx software – a user-friendly application that allows you to conduct an in-depth search within your storage device for traces of erased data that can be recovered. Alle prijzen in Euro incl. wettelijke BTW excl. verzendkosten voor het gehele winkelwagen.